The website mass production platform for directories, agencies and freelancers. Tidy is the free sitebuilder supercharging you. Make more websites in less time. Start by picking one of the options below. Migrate an existing website to Tidy with a few clicks. Start with one of our Tidy optimised, free templates. Start from scratch and make your own template in Tidy. Design/Develop locally or upload your own template. Run npm install tidy in your local Node.js environment to develop locally. Zip your template files, upload them to Tidy and continue developing in Tidy. 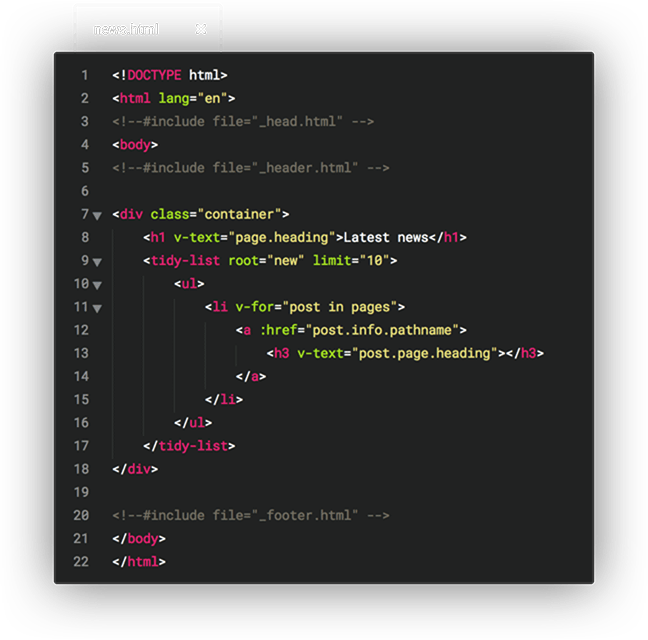 You can build the entire website without ever leaving the Tidy code editor, or develop a site locally with your current tools and use the site with Tidy. The JS API provides access to everything in your website (templates, pages, content, files etc.) and enables you to build your own components. If don’t want Tidy hosting with Nginx speed optimisation, Tidy uploads your site to any host you choose. Caching, loading speed optimisation, security, SEO... no need for plugins for the basic stuff, they are all included. Change the appearance of the whole site with a few clicks and preview the results in one glance. Start with one of the many Tidy templates, build your own or easily use a site you've already made. With the global styles you can completely change the appearance of a site and content blocks in seconds. Changing one main color potentially changes the whole theme of your site. Adjust the finer details of the layout and styles with Tidy’s properties panels or directly in the code. Adjust margins, paddings, background - whatever you need. 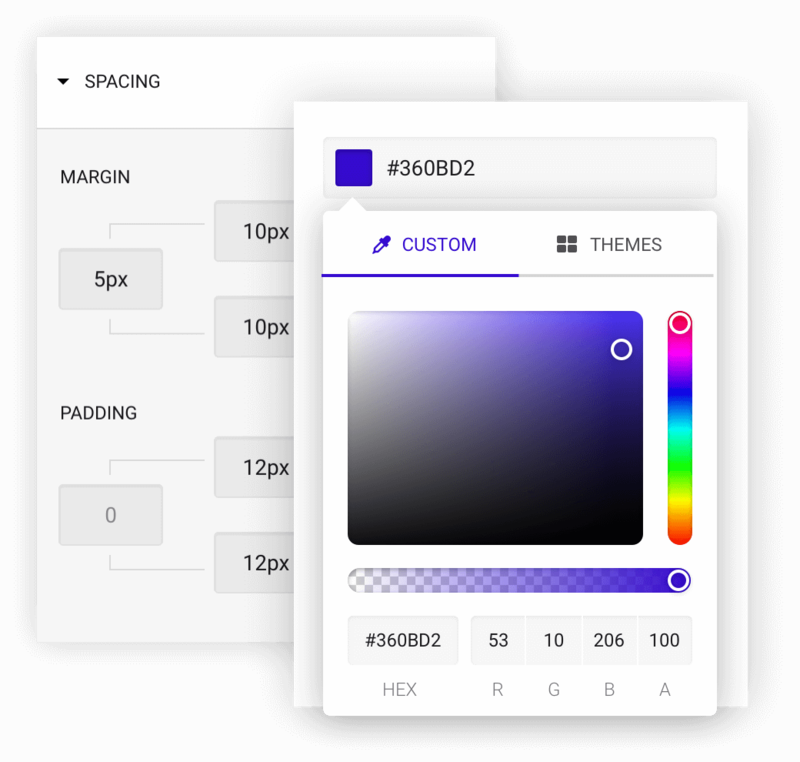 Advanced users can easily use CSS-styles to customize individual blocks. Bootstrap, Foundation, Skeleton...or even your own framework. Tidy is developed in close co-operation with small and large agencies. 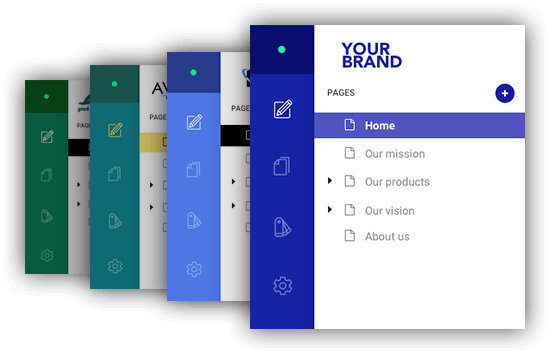 The UI, the emails Tidy sends and the client help pages can all be customised to your brand. Share resources between teams and sites, update multiple sites at once. Easily customise Tidy to suit your workflow and use the API to integrate with your existing systems. Sell more of products by helping your clients reach their goals. Get data based recommendations on how to improve your site. The Tidybot analyses your code and recommends improvements to build the perfect website. Tidy checks for usability, image sizes, SEO, conversion optimisation etc. 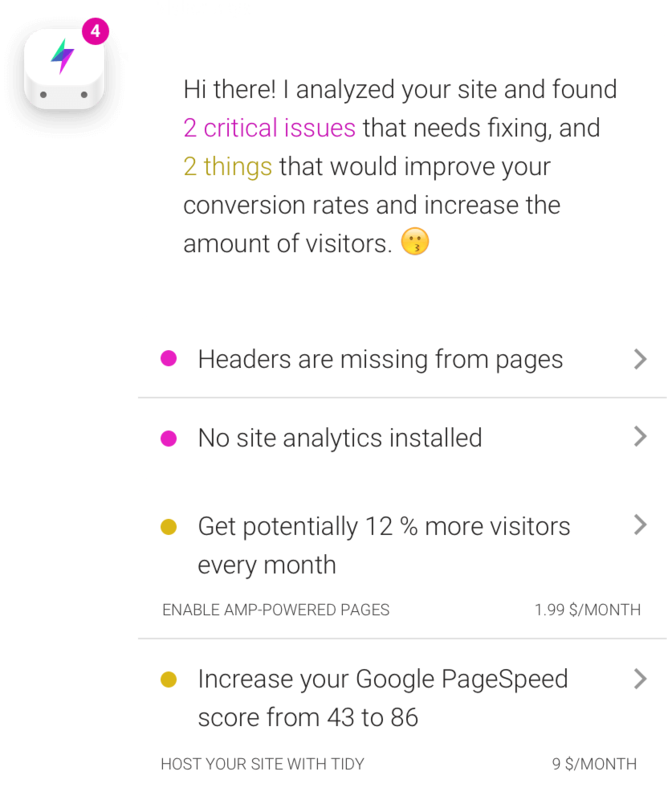 The Tidybot also analyses visitor data and recommends improvements to help the website reach its goals, like sell more products, get more leads, view more pages etc. No updates, no maintenance, no downtime, auto-scaling... It’s all been taken care of. The Tidy editor is always served as SaaS from our servers. It updates automatically on every login. Tidy servers run on Amazon with separate fail-safe, duplicated server clusters for the editor, database, API and client sites. All parts of the server stack is load balanced and more servers are automatically added when needed. Tidy automatically minimises and optimises code, styles and assets for each device. Naturally all templates and blocks are responsive. Tidy produces sites made out of static html, which are extremely hard to hack. The editor itself is protected with several security layers. You can easily export content and layout separately, if you want to import them to another CMS.